Are you a Dental Office Manager, Practice Administrator, or part of a Front Office Dental Team? YOU'VE FOUND YOUR TRIBE. Which Membership is Right for You? When we say “you’re never alone,” we MEAN IT! Whether you’re in need of professional advice or need to converse with other dental managers, AADOM has a community for you. AADOM Members Only Forum is the perfect place to converse with other dental managers like you! Don’t you wish you could discuss professional issues with other colleagues? Our Members Only Forum is a safe place to chat and bounce ideas off of other dental managers. AADOM chapters are recognized and approved extensions of the national association. They provide opportunities for continuing education, local networking, and much more. No dental practice is exactly like another, however when you work in a specialty practice you do have similar needs and challenges. Here’s a chance for you to find your tribe. Is your spouse the dentist in the practice? AADOM’s Dental Spouse Business Network is for you! This group of AADOM members connect to share ideas and address challenges specific to the delicate situation of being the dental spouse managing the practice! Each month AADOM highlights one of our members, sharing pictures and information to connect our virtual community. Sign up to be one of our featured members today! The Annual Dental Management Conference is a one of a kind experience. Three jam packed days of education, networking and career development in one place. Our vendor partners support your community by offering AADOM Member Discounts as well as additional educational resources. Visit AADOM's Value Added Resources Today! I'd like more information about AADOM's Dental Spouse Business Network. 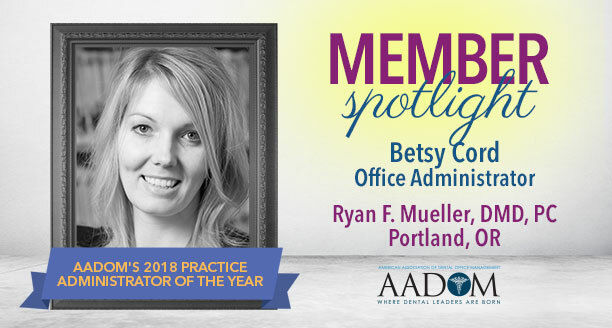 Every month, AADOM highlights one of our amazing members. Would you like to be featured in our monthly member spotlight? Please complete the AADOM Member Spotlight form below and submit. We will review and choose one member each month to highlight. If you have any questions, please contact us at info@dentalmanagers.com or by phone at 732-842-9977. Don’t you wish someone would have told you sooner about AADOM? Our Refer-A-Friend program rewards YOU for turning your fellow dental management professionals into AADOM members. Tell them to select the “Referred by a Friend” option and enter your name. Each referral is worth 10 points. Keep track of your points with our Refer-a-Friend Standings below. When you reach a Reward Level, choose your prize! The more you refer, the more you win! We are currently accepting speaker proposals for future conferences and AADOM events. Please complete the form below and submit. We will contact you if we have a speaking opportunity for you. Thanks for your interest in working with AADOM! For the dental practice heroes who aspire to be more, AADOM is the most powerful one-stop-shop in the world. We provide the industry’s best resources, supporting a tribe of empowered professionals who create and manage successful dental practices.